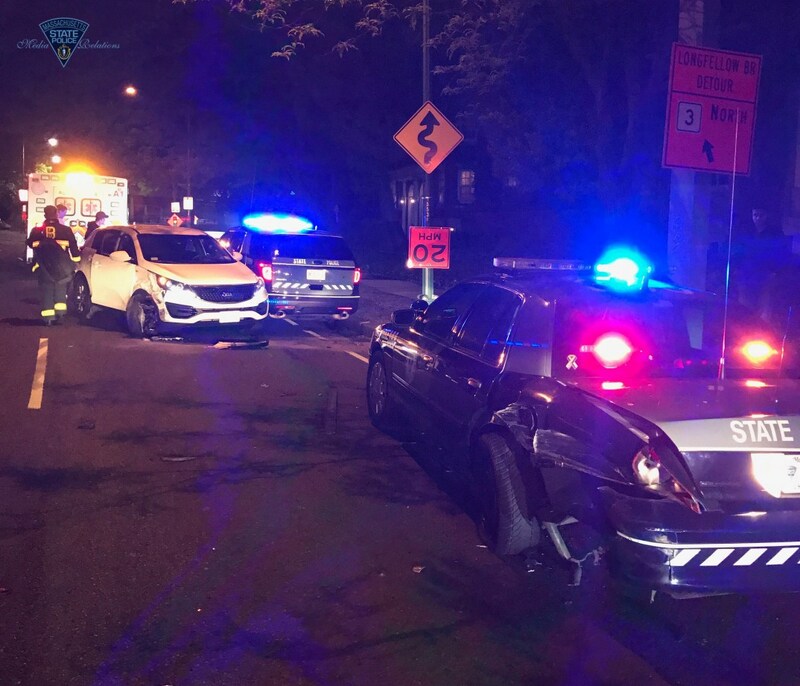 Massachusetts State Police report that at approximately 2:40 a.m. on May 21, 2017, an impaired and speeding driver struck two Massachusetts State Police cruisers on Storrow Drive and injured a civilian who was on foot outside his vehicle. 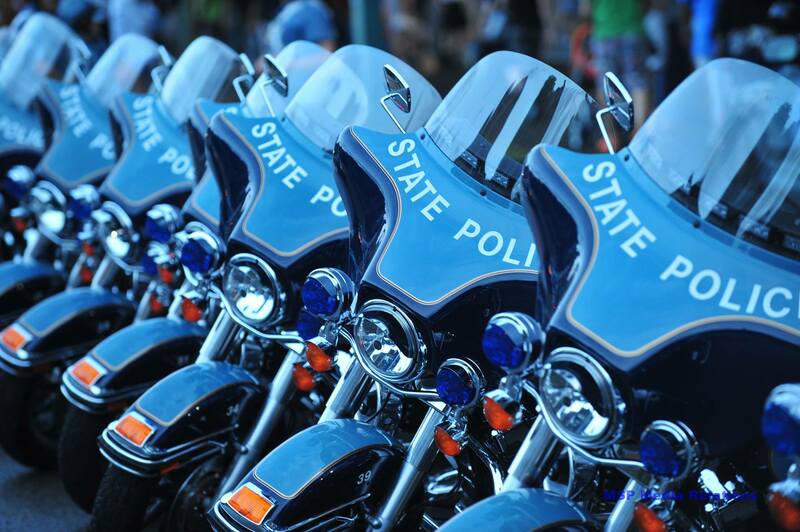 The sequence of events leading to the incident began when two troopers stopped a motorist for motor vehicle violations on Storrow Drive eastbound at the Charles Street exit. One cruiser was parked behind the other and both had their emergency blue lights activated. Both cruisers were parked behind the vehicle that had been stopped. The troopers exited their cruisers and had taken the driver they had stopped, a 24-year-old Lynn man, out of his vehicle as they conducted an investigation. At that time, a KIA Sportage utility vehicle traveling eastbound on Storrow Drive approached the cruisers from behind at a high rate of speed. The Sportage struck the left rear of the first parked cruiser, a marked 2009 Ford Crown Victoria, and pushed that cruiser into the cruiser parked in front of it. That impact then pushed the second parked cruiser, a marked 2014 Ford Explorer, into the Lynn man who had been the subject of the traffic stop and who was outside of his vehicle. The Lynn man suffered injuries believed to be non-life-threatening and was transported to Massachusetts General Hospital by Boston EMS. – Failure to Change Lanes for an Emergency Vehicle. DaSilva was transported to the State Police Boston Barracks at Leverett Circle, where he is being held on $10,040 bail. Neither trooper involved in the initial stop was injured. The Crown Victoria, the initial cruiser that was struck, sustained heavy rear-end damage and had to be towed from the scene. The other cruiser, the Explorer, sustained minor rear damage. The suspect’s KIA sustained heavy front-end damage and also was towed from the scene. This entry was posted in DWI Arrests by State, DWI crash photos, injury or death and tagged EDUARDO D. DaSilva, Massachusetts State Police, Massachusetts State Police report that Eduardo D. DaSilva slammed into two parked police cruisers while drunk, OUI Liquor; – Negligent Operation of a Motor Vehicle; – Unlicensed Operation of a Motor Vehicle;. Bookmark the permalink.